Packed into the new year’s fiscal cliff deal was some good news for working families. Most notable was a provision that extends the 2009 Recovery Act expansions to the Earned Income Tax Credit (EITC) and Child Tax Credit (CTC) by five years—targeted expansions that strengthened these credits for working families in response to the Great Recession and weak economic recovery that followed. These tax credits, in addition to encouraging work, also do a great deal to reduce poverty. We know this thanks to the Census Bureau’s new Supplemental Poverty Measure (SPM), which provides a more nuanced measure of poverty across the country, accounting for things the official poverty measure does not—like after-tax income, regional differences in housing costs, and the impact of government policies like the EITC and CTC. Based on the SPM, the EITC and refundable portion of the CTC (including the 2009 expansions) together lowered the poverty rate by 2.8 percentage points in 2011. The impact on child poverty was even greater: under the SPM definition the credits lowered the child poverty rate by fully 6.3 percentage points. Until recently, estimates of how particular anti-poverty programs affected the SPM were only available at the national level. 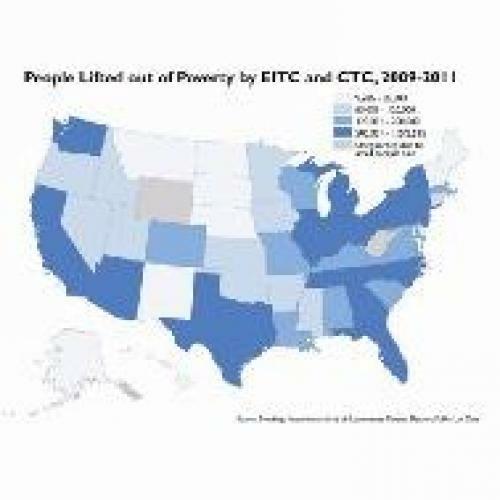 Thanks to public-use files recently released by the Census Bureau, we can now estimate the extent to which the EITC and CTC have alleviated poverty in individual states throughout the country. The map above illustrates the average number of people kept out of poverty by the combined impact of the federal EITC and CTC using the most recent data available. (Due to sample size issues, the map presents an average of three years of Current Population Survey data, from 2009 to 2011.) The EITC and CTC boosted working families’ earnings above poverty in every state; large states like Texas and California saw more than 1 million people lifted out of poverty, while at the other end of the spectrum, these credits kept over 9,000 residents of North Dakota from falling below the poverty line. Though currently the SPM only measures the effects of the federal tax code, many states also have local versions of the EITC that further strengthen the anti-poverty impact of the federal credit. And a number of these states and others are poised to make important decisions about state-level EITCs in the next legislative session. In North Carolina and Oregon, legislators will vote whether to extend their state EITCs, set to expire this year, while Utah legislators will decide whether to establish a state EITC for the first time. While Oklahoma and Kansas are likely to see proposals for a reduction in the size and impact of their state EITCs, Oregon and New Mexico could potentially expand their credits. As the new SPM data document reveals, tens of thousands of individuals in each of these states are kept out of poverty each year by the federal EITC, about half of whom are children. (See this table for detailed data.) As working families continue to struggle with the aftereffects of the worst recession since the Great Depression, these states have the opportunity to make sure their tax codes are working for those families by enacting, preserving, or expanding state credits that boost the impact of the federal EITC.